Paris Vegas Online Casino slot machines provide quality gameplay and you will find one of the best welcome packages in the business here. The promotions calendar is chock a block with exciting offers and everyone can feel like a VIP with cashback on every single bet you make. Paris Vegas Casino brings style, quality and all the fun of Vegas. Download Paris Vegas Casino in one of 21 different languages and join the international elite in playing your favourite casino games. The software took about 5 minutes to download and there is no instant play option. Once downloaded, registering to play takes less than 30 seconds. You will then see a page opening up in your browser showing you what promotions are available to you. Your lobby will also open up and you will have the option to choose whether to deposit and play for real money, or have a go in practice mode while you find your feet. If you are choosing to play for real money straight off the bat, you will need to fill in some more personal details and you will then have the option to choose your deposit method. Any free welcome bonuses or promotions you are eligible for will automatically be added to your account. Your lobby will launch with a deep blue sparkle and glittering lights, like any decent neighbourhood in Las Vegas, yet also retains some suave Parisian elegance. The lobby is neatly organised and your Paris Vegas online casino slot games top off the list of Blackjack, Roulette, Card and Table Games, the Jackpot Area, Video Poker, a New Games Area, Extra Games, your Live Casino and the popular Scratch Games. Clicking on Calendar at the top will open a new browser window full of promotions and bonuses available to you. There is also a nifty Level calculator where you can track your progress. If you play the long game and have no intention to trade this online casino for one of its competitors, the loyalty scheme will appeal to you even more. You move one step closer to the goal even when the outcome of individual gaming sessions is not the one expected. Paris Vegas great welcome bonus of 200% up to 1000€ is a nice incentive to start playing. 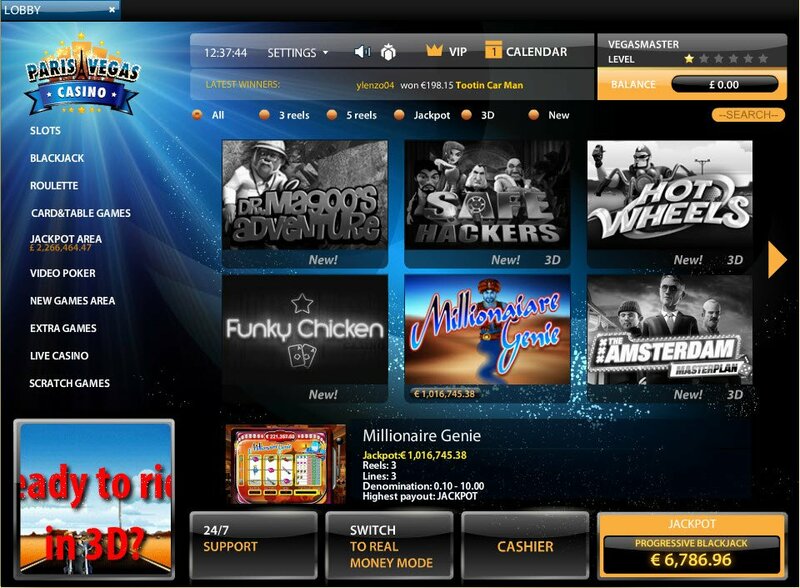 The 24/7 support and cashier buttons, in addition to the button that allows you to switch between Practice Mode and Real Money Mode, are conveniently located at the bottom next to the attractive current Jackpots on offer for different games. 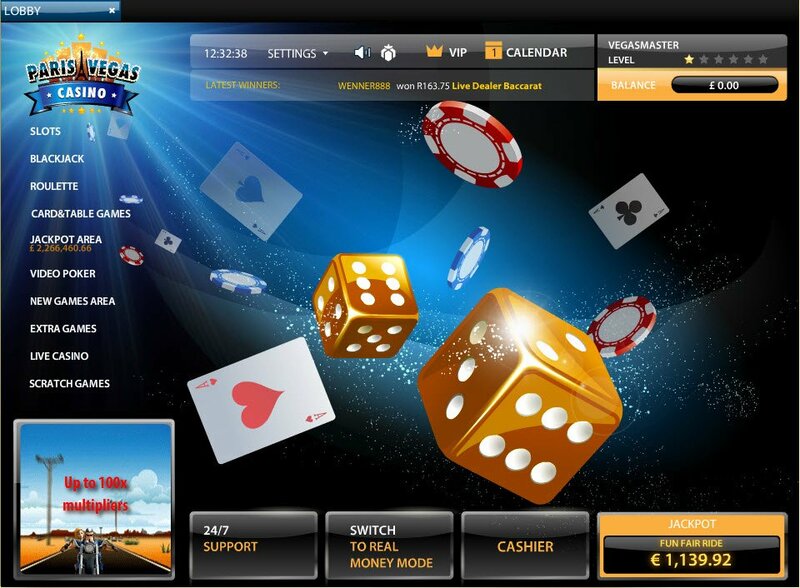 There are no restrictions whatsoever and you can play all the games offered in virtual money format, until you feel comfortable making the transition to real cash gambling. There are 3D slots galore available to play here and they all load in record time. You also have a great selection of Paris Vegas Casino jackpot slot machines to play for extra fun. The upside of competing for local jackpots is that you don’t have to deal with intense competition and you’ve got a better chance at winning the first prize. Whether it’s a life-changing amount, or a major bankroll booster, you cash it out quickly using one of the plethora of payment methods highlighted in this Paris Vegas Casino review. Paris Vegas Casino has created the ultimate playground for online gambling, but eventually the choice rests exclusively with players. One decision to make is between virtual games and those that can be played in the select company of real dealers. Assuming you choose the former, Merlins Millions, Medusa, Batman, Flip Flap, Hot Wheels and 300 Shields will keep you wire and for many hours in a row. Wild symbols create even more winning combinations, while scatter signs trigger free spins and many of them can be re-triggered. At least in theory, you could spin the reels for free indefinitely until your luck runs out and in between, win sizable payouts. If you are in the market for classic games and don’t mind locking horns with the RNG, Jenga, Bejeweled, Ghost Pirates and World Soccer are all fine choices. Paris Vegas Casino brings style, quality and all the fun of Vegas. Paris Vegas Casino mobile games feature all popular table games, including more than 10 different types of roulette, besides the classic American and European versions. The paradox of choice can be self evident when playing card games, such as Pai Cow and Craps, which also come in different flavors. Live blackjack, roulette and baccarat are more than a convenient distraction and all dealers are highly trained professionals, well-versed in the art of conversation. The “Other games” section was clearly more than an afterthought and those who venture into this uncharted territory will spend some quality time playing Hi-Lo, Doubles Heaven and The Big Wheel. More video pokers are to be added in a not so distant future, but for the time being fans of the genre can appease their appetite with Deuces Wild, Aces & Faces, Jacks or Better and Joker Poker. Paris Vegas Casino (also available on mobile) bonuses come with an added perk. On every single bet you make you will receive VIP cashback. 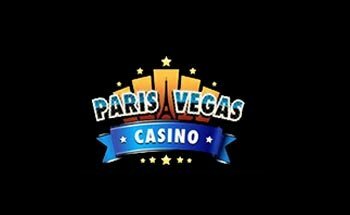 The Paris Vegas Casino no deposit bonus along with the welcome bonus is one of the best in the business as well; it’s a €3000 package that will give you 200%, that's up to €1000 on each of your first 3 deposits. When things look too good to be true, they usually are, but in this case there are not many strings attached to this bonus. 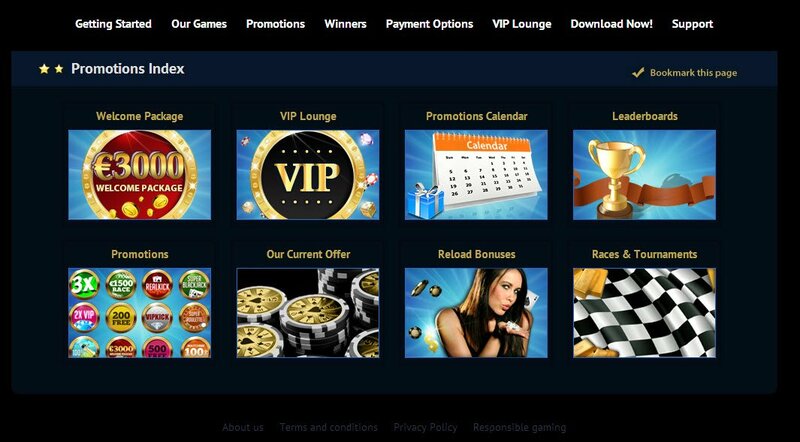 One thing worth mentioning is that the funds are awarded in the form of bonus money, which means that the bonus is removed after meeting the wagering requirements. Speaking of which, one would have to spin the combined amount through 45 times or more playing slot machines and only the profits can be cashed out. The maximum amount that one can wager in a single spin is limited to 10% of the total bonus, but this has the upside of mitigating the risks of ample downswings. All games can be played to clear the bonus, but video slots count for 100%, while other genres have a lower stake percentage contribution. Casino Paris Vegas is all about flexibility, but it’s up to you to find the most convenient way to clear bonuses. There's a whole calendar bursting with promotions to take advantage of and this review can't possibly contain all the goodies this online casino has to offer, so why not find out for yourself by signing up and checking out what you are entitled to based on how much you want to deposit and play to win! There are 3D slots galore available to play here and they all load in record time. You also have a great selection of Paris Vegas Casino jackpot slot machines to play for extra fun. The emphasis is on the welcome bonus and initial promotions, aimed at expanding the customer base. However, the long-term benefits are just as important and the most loyal ones are invited to join the VIP Lounge. Checking the calendar for promotions or searching for jackpots is made easy with the silky interface. If you made it this far, you are entitled to expect generous cashback deals on all your popular games and free bonuses for simply moving up the levels. Paris Vegas Casino mobile players as well as those who rely on desktop computers will be presented with constant bonuses and invitations to exclusive events. Last but definitely not least, the personal VIP account manager will make you feel like a superstar and cater to all your needs. The sky is literally the limit, because those who make it to the executive levels can win all paid vacations and return flights to exotic destinations and major sports events. Live Chat is available, although it is hidden in the support box in the lobby. This means there is no accessing Live Chat before downloading Paris Vegas Casino. There is a telephone number, based abroad to call 24/7 and email support too, they do try to respond to all languages but it is recommended to contact them in the universal language of English. There are 3D slots galore available to play here and they all load in record time. You also have a great selection of Paris Vegas Casino jackpot slot machines to play for extra fun. We all know that the house always wins, but it doesn’t necessarily have to be this way forever and ever. Paris Vegas Casino gives everyone a fighting chance, by keeping things fair and has independent auditors backing up their claims. By using an audited and certified random number generator, they make the pledge of keeping the games fair and unpredictable. Ongoing gameplay is monitored for fairness and the payout tables for all the games can be compared on the website. 128 bit SSL encryption technology is the first line of defense against outside threats and wrongdoers who might be tempted to break in. There is more than money to steal and with identity theft emerging as a major threat to online casinos, their efforts are commendable. Those who reside in Bulgaria and Slovakia might feel like Paris Vegas Casino went a step too far in its quest for safety by denying them access to the live games section. Several financial instruments popular in various European countries are allowed for deposits, but the list of payment methods for cash outs is more restrictive. You can withdraw your profits using Bank Wire Transfer, Cheque, ClickandBuy, Neteller, Visa Electron, Skrill, Visa without paying any commission. There are no hidden fees either, so the casino won’t eat away at your profits when you beat it fair and square. Delays are the exception to the rule and once players confirm their identity, they can expect swift transfers of less than 48 hours for electronic wallets. Choosing old-fashioned payment methods such as credit cards or bank transfers will only keep you waiting for a maximum of seven days. If time is not of the essence and you are hell-bent on using cheque to withdraw funds, you could be waiting up to 3 weeks. great jackpots, very nice promos. other then that nothing much to offer. pretty high score for only games from skillonet. the games are good but not enough of them. The games at this casino are good but its the welcome package that makes it truly wicked!